Relations between Pakistan and the Russian Federation were reactivated in 2007 after the 3-day official visit of Russian Prime Minister Mikhail Fradkov. He was the first Russian prime minister to visit Pakistan in the post Soviet-era in 38 years. He had “in-depth discussions” with then President Pervez Musharraf and Prime Minister Shaukat Aziz. The major focus of the visit was to improve bilateral relations with particular emphasis on ways and means to enhance economic cooperation between the two countries. [Image: Russian president Dmitry Medvedev engaged in conversation with his Pakistani counterpart president Asif Zardari, 2010]. For the most of the Cold War, Pakistan’s relations with then Soviet Union saw many ups and downs during different periods of Pakistan’s post indepndence history. During the 1947-50s Soviet Union enjoyed relatively healthy and strong relations with Pakistan when it had civilian governments. The relations, however, went ultimately cold soon after the U.S.-backed 1958 military coup d’état was staged by Gen Ayub Khan, the Commander in Chief of Pakistan’s armed forces, although attempts to warm the relations were made after the 1965 Indo-Pakistan war and in midst of 1970s, the relations were quickly improved and warmed. In the late 1980s, Pakistan allied with the United States and Saudi Arabia to support the Mujahideen rebels during Soviet occupation of Afghanistan. Soviet relations with Pakistan date back to 1922 after the Bolshevik Revolution of Oct.1918. From 1922-27, people who entered from Soviet Union into Pakistani territory then held by British Indian Empire, attempted to start a communist revolution against the British Empire. The series of coups known as Peshawar Conspiracy Cases; the British Empire was terrified after the intelligence on attempted communist revolution in India were revealed to authorities. From 1947-50 and 1965–69, the trade, educational, and cultural exchanges between two countries increased. But the Soviet efforts were undermined by Soviet Union herself when Soviet criticism of Pakistan’s position in the 1971 war with India weakened bilateral relations, and many people in Pakistan believed that the August 1971 Indo-Soviet Treaty of Friendship, Peace and Cooperation encouraged India to invade East Pakistan. Subsequent Soviet arms sales to India, amounting to billions of dollars on concessional terms, reinforced this argument. The USSR also kept vetoing every resolution on the East Pakistan situation whenever Pakistan brought the matter to the United Nations. Shashlik, originally a Russo Pakistani dish is a form of Shish kebab which, by the passage of time has gained popularity in many other parts of the world. Shashlik (meaning skewered meat) was originally made of lamb but can be replaced by other meats depending upon local preferences and religious observances. The skewers of meat are either all meat, all fat, or alternating pieces of meat, fat, and vegetables such as bell pepper, onion, mushroom and tomato. In 1948 Moscow directed a farewell message to then-Prime minister Liaquat Ali Khan. Pakistan had come on world map during the penultimate times of cold war, and the Soviet influence on neighbouring Imperial Iran had deepened. According to the studies conducted by the Institute of Strategic Studies (ISS), the Soviet Union did not welcome the Indian partition, fluctuating from cool to antagonistic and hostile relations for the new state. Moscow vehemently had criticised the United Kingdom on partitioning the region, calling it as the “Divide and Rule” stratagem of the foreign policy of Great Britain, and had earlier also labeled Muslim League as a tool of the British. In April 1948, at the UN Economic and Social Commission for Asia and Far East, Pakistan’s foreign officers announced that “she (Pakistan) would accept aid from any source”, but the Soviets did not respond to that request. In 1948, Prime minister Ali Khan made several attempts to Soviet Union to establish the relations, but Soviets remained quiet. 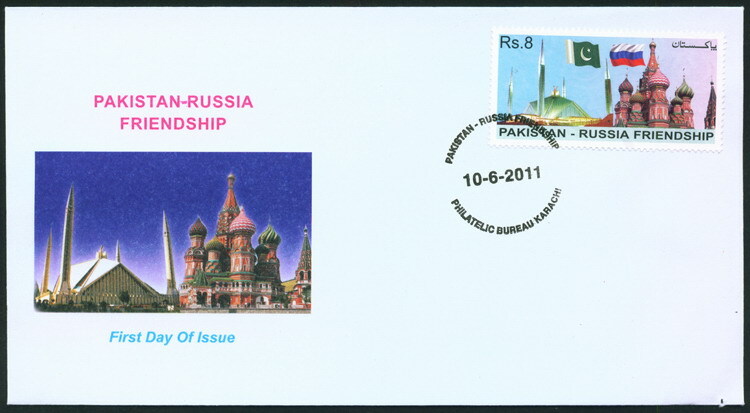 Pakistan – Russia Friendship Commemorative Postage Stamp June 10, 2011. Diplomatic relations between Pakistan and USSR were established on May 1, 1948 through the agreement concluded in New York by Sir Zafrulla Khan, the Minister of Foreign Affairs of Pakistan, and Andrei A. Gromykok, the First Deputy Foreign Minister of USSR. This agreement was succeeded by a consequent exchange of the relevant notes. Shortly thereafter the Embassies of the USSR and Pakistan commenced their functioning. 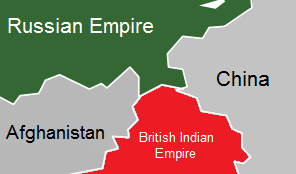 Left: The border of British India (now Pakistan’s border) showing the Russian Empire neighboring with Pakistan. After 1954-55 elections in Pakistan, prime minister Huseyn Suhrawardy, a left-leaning politician, made deliberate attempts to improve relations with the USSR. On March–April 1954, a delegation of the Soviet cultural troupe toured Pakistan and a festival of the Soviet films was held in Karachi. To reciprocate this, the Pakistani Government also sent a delegation to study the Soviet industrial and agricultural development. 1. Pakistan can make Russia Queen of Asia 2. 2. 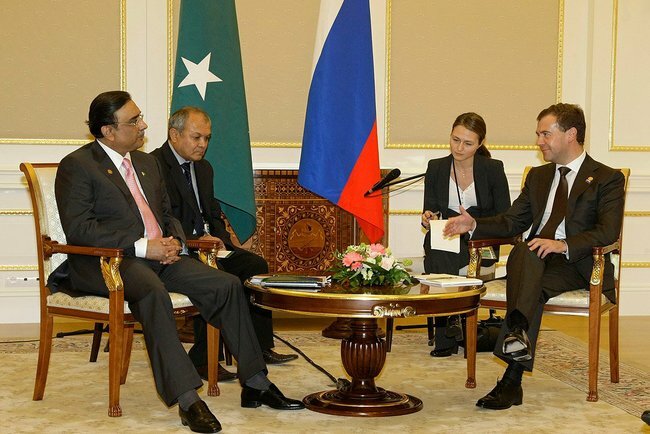 Russia – Pakistan: the Way is Open for New Projects 3. Pak–Russia Relations 4. After US, now Chinese bases in Pakistan! Disclaimer: The views expressed in this article are the sole responsibility of the author and do not necessarily reflect those of the ‘Wonders of Pakistan’. The contents of this article too are the sole responsibility of the author(s). WoP will not be responsible or liable for any inaccurate or incorrect statements contained in this post. Wonders of Pakistan supports freedom of expression and this commitment extends to our readers as well. Constraints however, apply in case of a violation of WoP Comments Policy. We also moderate hate speech, libel and gratuitous insults. We at Wonders of Pakistan use copyrighted material the use of which may not have always been specifically authorized by the copyright owner. We make such material available to our readers under the provisions of “fair use” only. If you wish to use copyrighted material for purposes other than “fair use” you must request permission from the copyright owner.